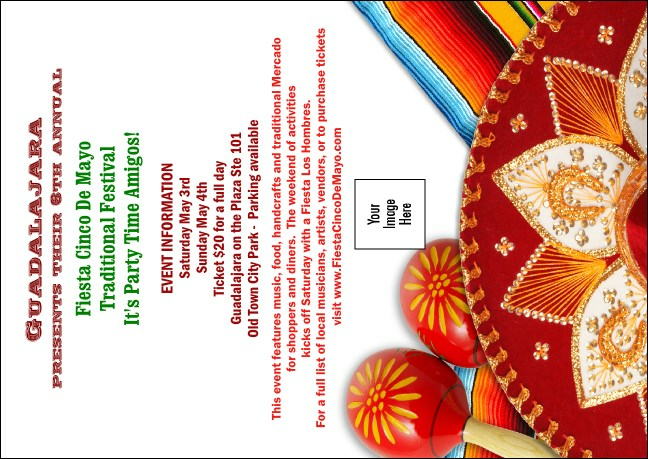 Throw on a sombrero and follow the beat of the maracas with a Fiesta Postcard advertising your next event! Featuring an array of bright Mexican colors against a clean, white background, this Fiesta Postcard template is great for Mexican themed dances, fundraisers, and picnics. Get guests excited about your next event with a professionally printed Postcard from TicketPrinting.com! With our simple, 15 minute customization process, you can be back to the party in no time!